Temperament is one of the questions often raised, especially by parents with young children. The first thing I would stress is that an 8 week old puppy is the one who needs protection! Young children - with the best will in the world - can damage a young puppy very easily. 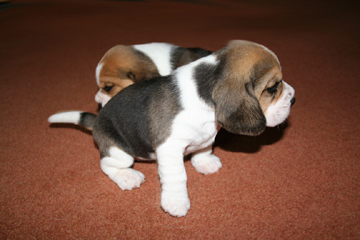 Those with temperament as a top priority would do well to find a dog with a friendlier nature than a beagle. The breed standard states that a beagle should be “amiable and alert, showing no aggression or timidity.” Now in my 13th year of involvement with the breed, and with a house full of 7 little scallywags, aggression has never been an issue. Whether you have one or are daft enough to have seven, make sure your beagle(s) know who their pack leader is - you! When out for “walkies” they will bark when they see another dog approaching, but when they do come nose to nose it’s with tails wagging and the friendliest of greetings. I know of some beagle males who are a bit intolerant of other male dogs if they get too close, but overall as a breed temperament is excellent.